One of the things I enjoy most about my profession is that I am continually learning about new aspects and people related to the Arts and Crafts tradition and style. I was recently commissioned to design and build three exterior lantern fixtures and address plaque for one of the several Pratt Houses in Berkeley, CA. John Hudson Thomas, the original architect of the home, designed and built the residence for John R. Pratt. 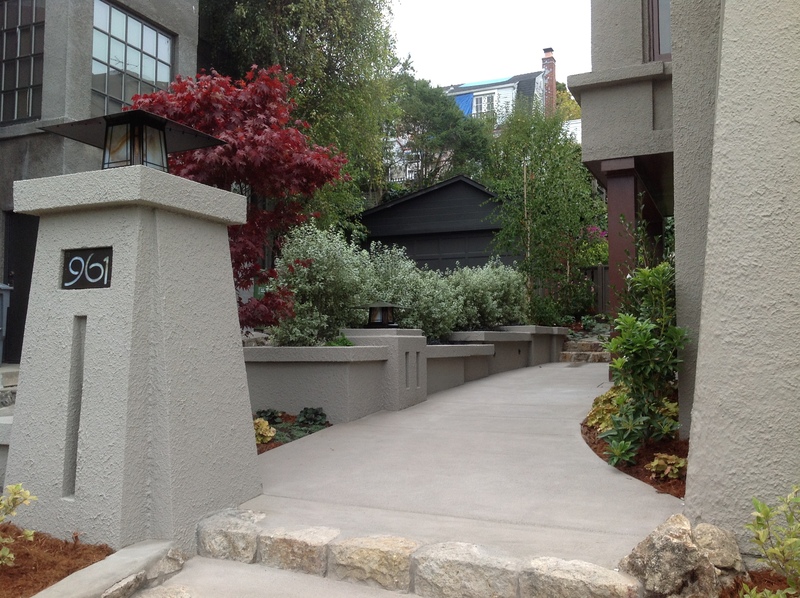 Thomas was a prominent figure and very prolific Bay Area architect in the early 20th century. The home is one of three adjacent houses designed so that the side windows of each house do not look directly into the neighboring house (a very neat trick). The current owners re-landscaped the front of the house, keeping true to the original intent of the design. They included new exterior lanterns to echo Thomas’ design themes. The house is designed in the Viennese Secessionist style: A fairly simple look, which makes the details very important. For the lanterns’ glasswork, I referenced the asymmetrical window panels from the house. Many of the vertical lines on the house have a slight angle that I incorporated in the lanterns’ sides. I added geometric, raised “appliqués” that are a featured design element on the facades of the houses. Thomas grew up in the San Francisco area. After earning an undergraduate degree from Yale University, he returned to San Francisco and completed a graduate degree in architecture at the University of California-Berkeley in 1904. He was a contemporary of Julia Morgan, and shared mentors and architectural influences, like Bernard Maybeck from Cal Berkeley and John Galen Howard. Thomas is known as a member of the First Bay Tradition of architecture, an Arts and Crafts-related style characterized by its links to nature and use of locally sourced materials, such as redwood. Thomas began his career working with George Plowman, his partner in designing understated residences in the rustic Arts and Crafts tradition. After a four-year partnership, Plowman relocated to Los Angeles and Thomas set up his own practice. Thomas’ designs evolved from modest Craftsman influences to include stylistic elements from Gothic, Mission, Prairie School, and Viennese Secessionist traditions. His houses became more dominant in their landscapes, and wood gave way https://www.acheterviagrafr24.com/acheter-du-viagra/ to more massive-seeming stucco facades, with over-scaled elements. His organic work became increasingly geometric, recalling much of the architectural work of Charles Rennie Mackintosh. Texture, light and form became central to his progressive design development. In his plans, he selected motifs from many disparate sources and combined them to make a unified statement. His tendency to integrate apparently unrelated imagery into a cohesive structure became one of Thomas’ architectural trademarks. It was a pleasure to learn about Thomas and add my work to the home.